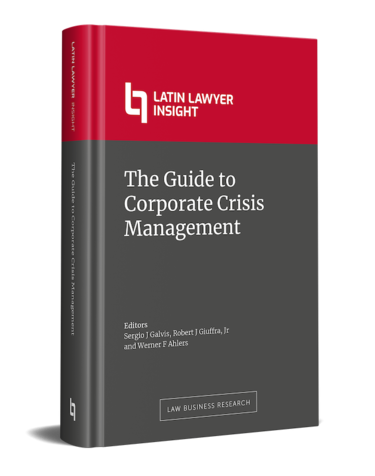 Latin Lawyer is proud to present The Guide to Corporate Crisis Management, featuring the latest insight on crisis management from 18 leading law firms and consultancies. The guide, which has been edited by Sullivan & Cromwell LLP’s Sergio Galvis, Robert Giuffra Jr and Werner Ahlers, is free to view and can be downloaded here. It is designed to assist key corporate decision makers and their advisers in effectively planning for and managing corporate crises in the region. It covers the impact of political instability, the role of communications in crisis response, approaches to bribery investigations and game plans in response to financial stress. Written by leading names in the field and published by Latin Lawyer, the Guide is split into five distinctive parts: Government Relations and Political Risks; Public Relations in a Crisis; Anti-Corruption and Government Investigations; Securities and Regulatory Actions and Litigations; and Restructuring and Insolvency. The 189-page hardback guide is included as part of a Latin Lawyer subscription.